Array your nails in a myriad of color this spring with China Glaze® limited edition Prismatic nail polish collection! Inspired by the colors formed by the refraction of light through a prism, Prismatic by China Glaze® combines glitter and holographic particles to create the ultimate eye-catching, 3-dimensional manicure. Ray-Diant: Greenish-gold shimmer filled with specks of silver, pink, green, orange and blue. Liquid Crystal: Bright blue holographic with purple tint dusted with silver, gold, green, pink and orange. Prism: Grape purple holographic gleams with pink shimmer and glitters with pieces of pink, blue, green, orange, silver and gold. Full Spectrum: Baby pink bursts into holographic magenta to party with silver, gold, blue, pink and green particles. Optical Illusion: Aqua green glimmers with a hint of purple filled with pink, yellow, silver, orange and green flecks. 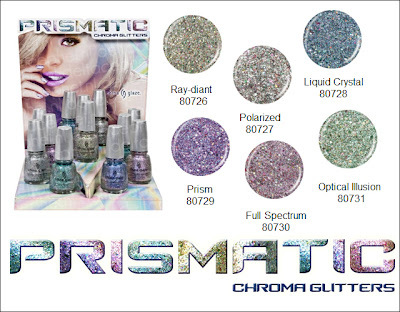 China Glaze® Prismatic will be available April 2012. Individual shades retail for $8 (US). I don't know about you, ladies... but this collection already has me salivating. I know Kayla Shevonne already has a preview up of the swatches until I snag my collection. What you do all think?